One of the most powerful tools that designers and architects use to communicate their ideas is freehand sketching. This simple act of putting pen to paper allows the architect to translate thoughts and words into forms and abstract visuals. These visual interpretations build and refine until it works within the given parameters and combines the primary conceptual ideas. 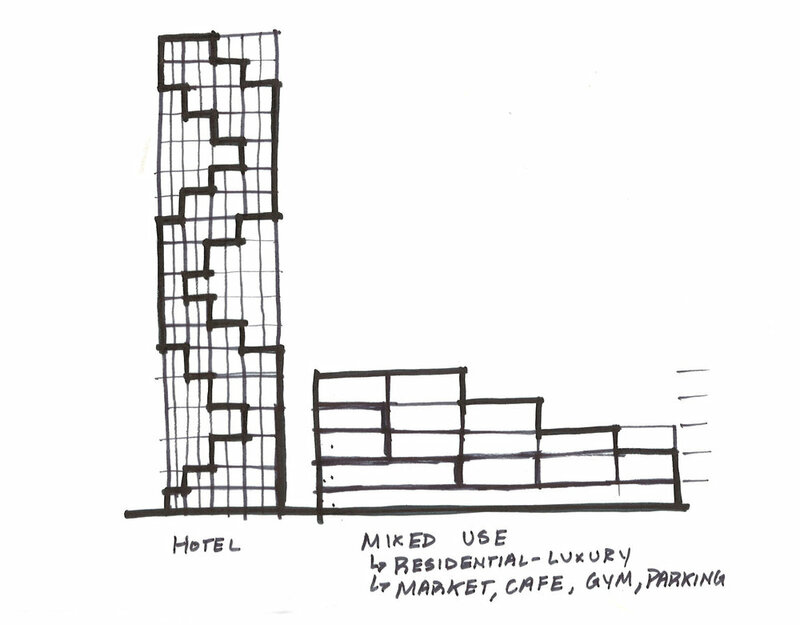 However, I've found that many young architects are afraid or not used to developing their ideas through sketches. Here are stories of my old fears with sketching and how I gained the confidence to sketch at all design meetings. During my early years in architecture school, I was afraid of sketching my ideas on paper because I wasn't used to drawing. In fact, I would try so hard to look at an object and sketch it on paper and see that there was only a slight resemblance to the object. This instilled in me a fear of sketching and sharing my sketches with my colleagues and peers. You see, I had this thought that a sketch had to be perfect and showcase a final design of an architecture project. Whenever I looked at sketches done by my peers or images online, I would see beautiful works of art that clearly conveyed the concepts and ideas of the project. So I decided that freehand sketching wasn't my medium for generating and conveying my architecture ideas. Years passed and I found my passion for architecture. I was constantly designing my projects in Rhinoceros, which is a modeling software used by many designers. Due to my belief that I was terrible at hand sketching, I developed my architecture designs primarily on the computer. I never sat there with paper and pen ready to sketch new ideas. I simply modified the 3 dimensional model to incorporate the new ideas. Then, I started pursuing design competitions and I went on a search for team members. When the team was finalized and we sat for our initial meeting, I went over the design brief and started a design discussion so that everyone could share their ideas. As each person continued sharing and building on ideas, I took notes and jotted down the main words and phrases that captured the essence of what would soon be the concept of our project. The discussion continued and my list grew from one to two, then three, and four pages of notes. Eventually, someone in the group opened his sketchbook, picked up a pen, and began sketching an idea in his head. When he started sketching the other group member, who was talking, slowed down and eventually stopped and watched as the other member sketched. Eventually, we all watched as the person continued developing his ideas and we would each chime in with an idea that started with “what if…”. When the person finished sketching, he turned it upside down so that everyone in the group could see what he was working on. After a second of staring at his sketch, he began talking and walking us through his ideas. As he pointed to critical areas of his sketch, most of us nodded our heads and expressed our approval of disagreement. Through the simple act of sketching, we were able to visualize the same ideas and work together to build upon them. In fact, whenever someone else chimed in with an idea, the sketchbook and pen would slide over to them and they would be tasked with visually representing their idea to the group. At first, some of the members were reluctant to sketch, but as they verbally thought out loud and sketched at the same time, their ideas flowed onto the page and everyone was able to visualize the same thing. Eventually, the paper and pen made its way to me and I was hesitant to share my ideas through a sketch. As the master keeper of all the notes, I had several ideas that combined everyone's thoughts into a comprehensive vision for the project. So, I decided to shut off the part of my brain that was telling me how awful I was at sketching. I picked up the pen, pulled the sketchbook closer to me, and started telling the group my ideas out loud. As I spoke, I visualized the ideas in my mind and put the pen on the paper. With each idea, my excitement grew and the pen followed. It was as if my mind and body were connected and working towards the same goal of conveying my thoughts to the group both verbally and visually. By the end of our design discussion, we managed to have a successful charrette and came up with a comprehensive and compelling concept. Everyone left that meeting with the same thoughts and excitement and we were able to develop our final proposal in a short amount of time. Today, I'm happy to say that I'm not afraid of sketching. I embrace it as a tool at all of my meetings both at the architecture firm with my colleagues and our clients as well as in discussions with my friends who are not architects. Sometimes, I'll hear an idea that a friend has or even a product that I brainstorm with my friends. I'll grab a piece of paper and pen and start sketching ideas. At my office, I've found sketching to be the fastest way of sharing an idea with my colleagues and vice versa. Whether we're sketching a new design for a building, elevations to figure out a facade design, or details for a project, everyone encourages one another to visually share their ideas. This saves the team and firm so much time and energy by reducing the amount of miscommunication between team members and ensuring that everyone has the same vision for the projects and tasks at hand. Being able to sketch without the fear of judgement has helped me develop complicated design ideas and easily convey them to my team. It has allowed me to develop several iterations of a design for my projects in a fraction of the time that I would've spent generating the design in a digital model. Most importantly, I learned that no one judges you as your sketching in front of them at a meeting. They look on with curiosity and excitement to see what ideas will emerge and their mind starts to build on the ideas that you're currently sharing. Remember, sketching is a powerful tool for expressing your ideas. It doesn't have to be pen or pencil and paper. It could be making physical models, origami, or digital sketches on a tablet. It's an iterative process that will lead to more developed and refined outcomes. So, find your medium for sketching and just start doing it!